December Burger of the Month – Merry Swissmas! The holidays are right around the corner, so what better way to celebrate than with Teddy’s Burger of the Month for December, the Merry Swissmas Burger! The Merry Swissmas burger is topped with 2 slices of melted Swiss cheese, tasty Bacon and delicious Grilled Onions. A perfect present for that special someone in your life, wish them a Merry Swissmas with our December Burger of the Month! 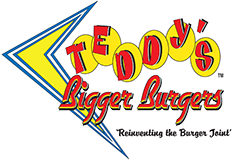 And the perfect addition to the Burger of the Month is the Teddy’s Shake of the Month – The Mint Chocolate Chip Shake!